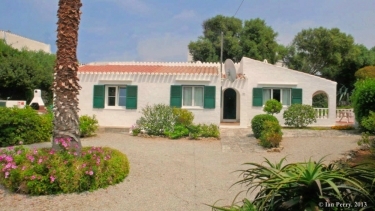 Menorca (Minorca) is the gem of the Balearics and this self catering, privately owned, holiday rental villa is air conditioned and set in a quarter acre grounds and sleeps 2 - 7. 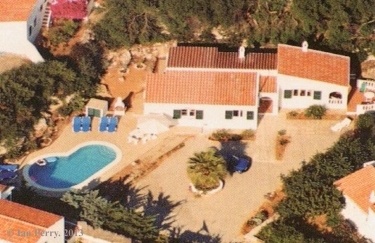 It has a private pool, large terrace and barbeque, and a further patio. The property is situated in Son Vilar, a quiet residential village on the outskirts of the popular Mahon and Es Castell, and is close to amenities, superb restaurants and bars, and a short drive to gorgeous beaches. 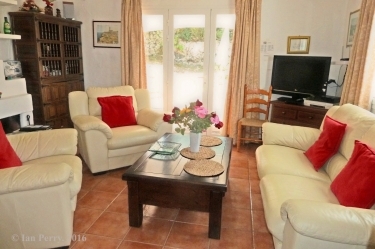 An ideal base for families or couples seeking a villa holiday on this lovely Island. It is fully equipped (including Satellite FreeSat TV), and all linen is supplied and laundered weekly. A hire car can be arranged direct in Menorca with a good discount for my tenants. Barbeque. The villa is tastefully furnished throughout and the kitchen is fully equipped with a large fridge (stocked with basic food and drinks for your arrival! ), cooker, microwave, toaster, coffee maker, iron, washing machine, utensils, crockery and glasses, as well as all linen except beach towels. All bedrooms are air conditioned, both COOLING or HEATING, and sleeps two to seven. The property also has a Satellite TV (Free To Air), Playstation 2, CD & Cassette Player, and a DVD and VHS Player in the lounge. There is also a Free High Speed Internet Wi-Fi throughout the villa and terraces. The villa is thoroughly cleaned before your arrival and on your subsequent departure. Fresh linen and a villa clean is supplied weekly, and the pool is regularly cleaned during your stay. If there are any villa or pool problems a quick phone call to my local manager will resolve it. Many past tenants are regular visitors (60%! )-which speaks for itself. The rentals shown are for a PARTY SIZE OF 2. There are small SUPPLEMENTS in the rental for larger party sizes (3 - 7), and reductions for longer stays of 2 weeks or more. Please contact the owner (with your NAME and POSTAL ADDRESS) for a FREE brochure and FULL PRICE LIST, and booking conditions (NO OBLIGATION - YOU'RE ONLY ENQUIRING).